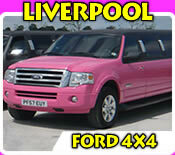 Anyone looking for pink limos in Liverpool need look no further than this stunning Ford Expedition 4x4! Exclusively available through Northwest Executive, this superstretched SUV is licensed for a maximum of 14 passengers and a comfortable and fun ride is guaranteed for all! 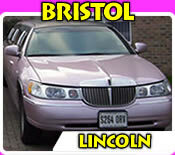 Pink limo hire with a difference! With its eye catching design and colour scheme you'll be sure to turn heads wherever you travel in Liverpool, Warrington and Merseyside. So whether you're planning a bar cruel along Seel Street and St. Peter's Square or a gathering with friends in Concert Square, you'll feel like a VIP as you arrive at your destination! 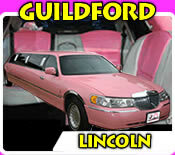 Colour co-ordinated pink and black leather seating throughout the passenger area! 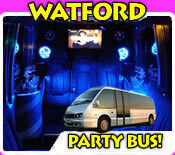 Neon backlight VIP bar area with drinking glasses for everybody aboard! Black window line with tinted windows for that superstar car look! Flatscreen TV units and DVD player - bring a film along for the ride! Fibre optic lighting and starlights along mirrored ceiling - a real nightclub feel as you cruise around town! A real superstar limousine just like those seen on MTV and in Hollywood! A fun and exciting chauffeur car for hire in Liverpool, Warrington and across Merseyside! So what are you waiting for? Get a great quote for hire by completing the form below and we'll get back to you with a fantastic rate. Alternatively feel free to call our helpful bookings team on 0800 197 6579 (quoting the Pink Limos website for the best rates). 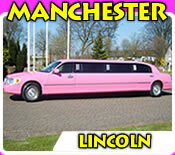 Book Your Pink Limo In Liverpool Today! 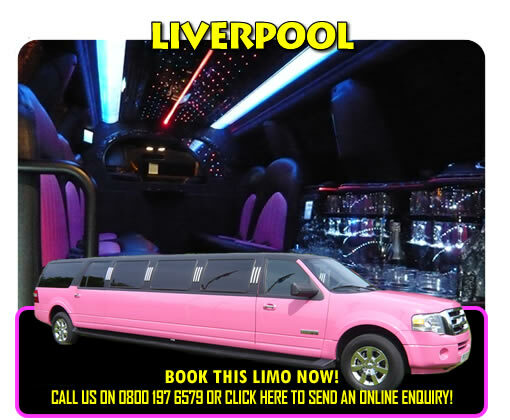 To get a great deal on pink limo hire in Liverpool call FREEPHONE 0800 197 6579 (quote Pink Limo Listings for preferential rates), email bookings@liverpoollimohire.co.uk or just complete the enquiry form here!